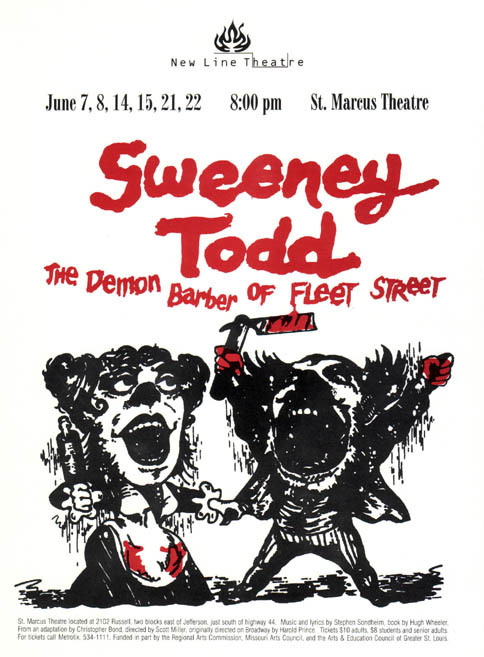 Sweeney Todd is one of only two musicals that Stephen Sondheim has initiated himself (the other is Passion). Though the massive original production was very effective, Sondheim has said that he intended it to be an intimate chamber musical with few sets. And that may be the way it is the most effective, the most chilling, the most personal. This is not a show intended to leave an audience happy and safe in the knowledge that Good always triumphs over Evil. Sweeney Todd is meant to disturb. Of the many musical motifs used in Sweeney Todd, one of the most interesting – and appropriate – is the dies irae. This chant melody from the Mass for the Dead has been used for centuries in music about death and dying. It first appears in “The Ballad of Sweeney Todd” as the melody to the chorus (“Swing your razor wide, Sweeney...”). It's also found, upside-down, as the accompaniment to “The Ballad of Sweeney Todd,” and used as underscoring throughout the show. This inverted version also becomes the vocal melody to “My Friends.” Thus, the dies irae connects the opening number describing Sweeney with both his song about why he will kill (“Barber and His Wife”) and his song about how he will kill (“My Friends”). To some extent, they are saying, we all live in the past, we all make mistakes we regret, and we all have revenge in our hearts at one time or another. Perhaps we don't go to the extremes that Sweeney did; but then again, how often are we put in the very extreme circumstances into which Sweeney has been thrust? Like Sondheim's Assassins, Sweeney Todd also makes the case that society is to blame – for the unfair class structure, exploitation of the working classes, the abuse of power, a corrupt government and justice system. Like Assassins, the black humor in Sweeney Todd allows us to distance ourselves from the horror of what's happening, but it also makes us realize how easily we can trivialize murder and brutality. Is “A Little Priest” all that different from Oliver Stone's film Natural Born Killers or Quenten Tarentino's Pulp Fiction? As a society, we have grown numb to death; we see it so much on the news, in television shows, in the movies, that it hardly fazes us anymore. Through wars, urban riots, and “ethnic cleansing,” killing has become an impersonal act. And perhaps that's one of Sondheim's points – the fact that Sweeney and Mrs. Lovett can joke about the brutal murders they will commit is an indictment of our culture. But remember that they're not the only ones laughing – so are we. Scott blocked the show using the entire theatre as a stage. The cast was often out among the audience. There were two satellite stages, one on the left of the main stage and one on the right. The main stage was used only as Sweeney's barber shop. Scott blocked the opening number with the cast spaced and staggered the width of the theatre on the floor in front of the main stage. During the song there are quite a few one line solos from various cast members. I think the cast enjoyed watching the audience during the opening number as much as the audience enjoyed watching us. As each solo was performed, the audiences' heads would turn in unison toward the sound. First left, then right, then center. It was quite a funny sight. It was almost like they were watching a tennis match or they were a hundred cats looking at the same piece of string being dangled in front of them. I'm sure that everyone who has been involved in theatre has one show that will forever stand out as a career highlight. For me, this highlight is New Line's production of Sweeney Todd. Mrs. Lovett possesses a delicious sense of humor and that, paired with her obvious character flaws, provided me with a never-ending source of challenges, pleasures, and memories. One of my least favorite memories of this production, however, occurred on opening night. I was always particularly nervous before my first scene which contained the song “Worst Pies in London,” a song in which it is very easy to become tongue-tied or drop a line. This night, however, it went flawlessly and I was ecstatic. Just off stage I uttered a very quiet but jubilant “Yes!” and in doing so missed the two steps leading down and, instead, fell off the side with my ankle twisted underneath me. As soon as I heard that “crunch” sound and felt the sickening pain, I knew it was sprained. I literally crawled back to the dressing room where everyone thought, at first, that I was just playing some kind of joke. I guess it was the tears streaming down my face that convinced them that I was definitely not pretending. We were able to find a roll of duct tape with which I wrapped my ankle and the show went on. I can honestly say that, on that particular night, at least, I had no trouble finding the right motivation for Mrs. Lovett's cry of anguish as Sweeney throws her into the oven! Every night, several white shirts and barber cloths would get fake blood on them, and someone had to wash them each night after the show to make sure they were blood-free for the next performance. That task fell to me. Let's talk about stress. I'm disabled. It's my first show in six years. It's my fourth musical in twenty-five years. It's my first Sondheim show. It's a New Line show and I'm working with Scott Miller for the first time. The temperature in the theatre is near one hundred degrees each night. Now, let's add to that, I'm crossing state lines, from Missouri to Illinois, every night with a trunk full of “blood-soaked” clothes. If the police had ever stopped me during that time, they would still be digging up my yard looking for bodies. And yet, New Line's Sweeney Todd was the best thing to happen to me in years. It was interesting and a great deal of fun.